If you’re not asleep during staff meetings, you’ve probably heard the phrase “research-based practices” thrown around a lot. Do you silently ask yourself, “Sooo, which practices are research-based anyway?” I don’t know about you but it’s been a little while since I originally learned about the people who did some of the major research in education. Lucky for all of us, I have put together a cheat sheet. All of these guys did a lot more work than what is mentioned in this graphic. I just tried to pull out what was most relevant to teachers. The cool thing is, you probably recognize a lot of these practices as thing you’re already doing. Lev Vygotsky – How do you decide the level at which to instruct your students? 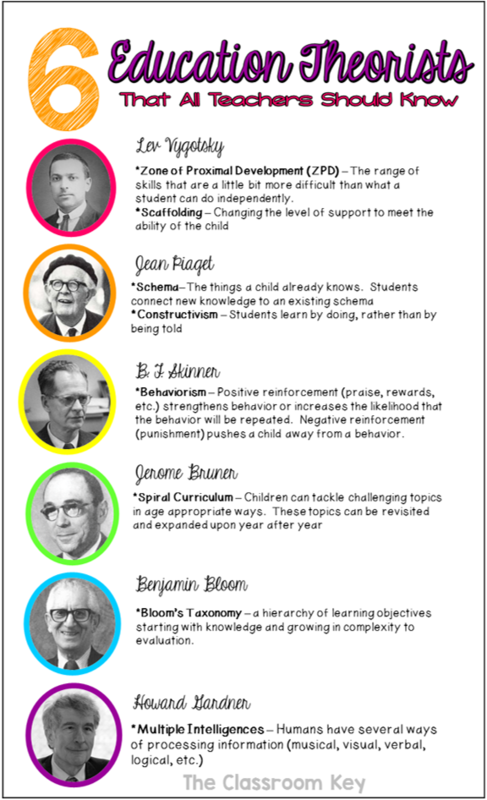 Vygotsky says to determine their Zone of Proximal Development (ZPD). This means the skills that are just a little bit beyond their reach. When you are working with a small reading group, don’t pick books that kids can read perfectly. Pick ones that are just a little bit challenging, that students will need some support to read. Eventually a student’s ZPD bumps up higher because they have mastered the skills you were supporting them with. Jean Piaget – Piaget was a constructivist which means he believed that kids learn by manipulating, modifying, and otherwise working with concepts. They construct their own learning rather than just being told something. Piaget worked with the idea that the things people know are organized into schemas. When a child learns something new, they either assimilate it into an existing schema, change their schema, or develop a new schema. Do you activate background knowledge before a lesson? You’re helping students tap into their existing schema! B.F. Skinner – When I taught second grade and my class was on the wrong track, I would look for the one kid doing the right thing and say, “Wow, I love how Jesse is standing with his hands to his side and his voice turned off.” As I positively reinforced this behavior with praise, other students would jump on board, too. This is the heart of behaviorism. It’s the idea that praise and rewards positively reinforce a behavior and encourage kids to continue with it. Punishments discourage students from a behavior. Beyond following rules, there are learning actions we can reinforce. If you display quality student work, praise students for using strategies, let students publish on cool paper when they have their writing perfect, etc. you are using behaviorism to guide students toward the behaviors and actions of successful adults. Jerome Bruner – If you have decent curriculum to use, you’ve probably seen Bruner’s idea of spiral curriculum at work. Elementary students can’t design roads and bridges but they can begin to learn about the physics of how the slope of a ramp affects the speed of a ball rolling down that ramp. Each year they can revisit and build on their previous learning. Benjamin Bloom – You may have heard of Bloom’s Taxonomy. It’s a hierarchy of intellectual behaviors. The lowest level is remembering facts. The highest level is using your knowledge to create something new. With the new Common Core standards we’ve heard a lot about increasing rigor for our students. One way to do this is to make sure we’re involving our students in higher order thinking activities at the top of Bloom’s Taxonomy, not just in memorizing facts. Howard Gardner – Gardner found that people have more than one way of processing information and that a typical IQ score doesn’t completely measure intelligence. He created the theory of Multiple Intelligences. In the classroom we can engage multiple intelligences by singing educational songs, allowing students to work through concepts verbally, through art, through writing, with partners, and through movement. Follow Hannah @ The Classroom Key’s board Teacher Cheat Sheets on Pinterest. If you right click on the picture and choose “copy image” then you can open up a program like Microsoft PowerPoint or Word, right click again, and choose paste. You may need to resize the image but then you can print it out. I like how the author talks about the heart of behaviorism and using praise for one child so that the rest can follow them as an example however I do feel like the more you use praise that the children will purposely act in a inappropriate manner in order for more rewards to come for them to keep behaving correctly so it could have a negative affect to it as well. Actually the Author has the idea of negative reinforcement wrong. It’s not actually punishment. It’s 2 different things. Many people aren’t aware that because it’s easy to associate negative reinforcement and punishment. Negative reinforcement is the removal of the reinforcer from the environment. Punishment is not presenting the reinforcer and placing the subject in a timeout of sorts. Ex: student hits another student. They get removed from the situation to be isolated. Ex if negative reinforment: student knows that they can work for candy. Candy is placed in a visible location. Student answers wrong and they receive no candy. I love this collection and it reminds me of when I learned about them in college. Spiraling and Multiple Intelligences are my favorite but all of these threories can improve student learning experience and knowledge retention. I will keep this for future reference. Thanks for sharing!